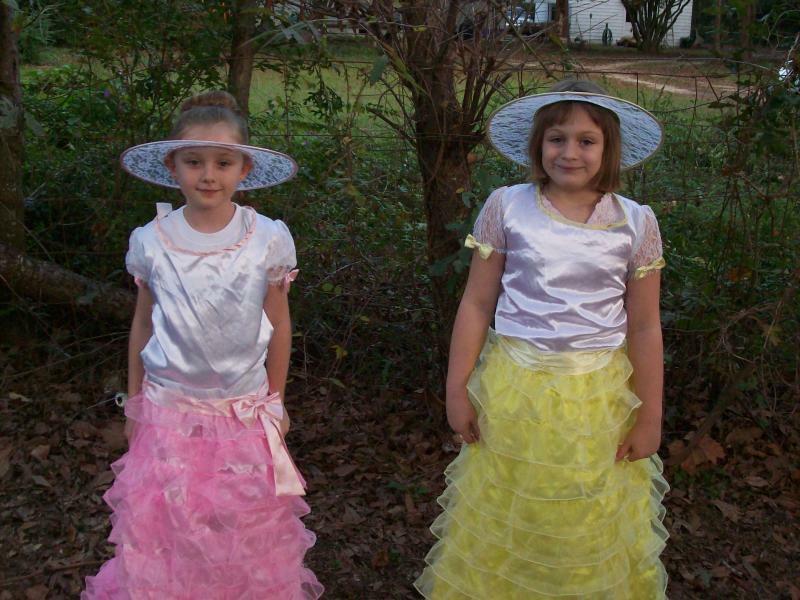 My Business - Southern Belles Promotions Who We Are:We love to have fun doing what we love. Interacting with others while passing out freebies or giving product information. 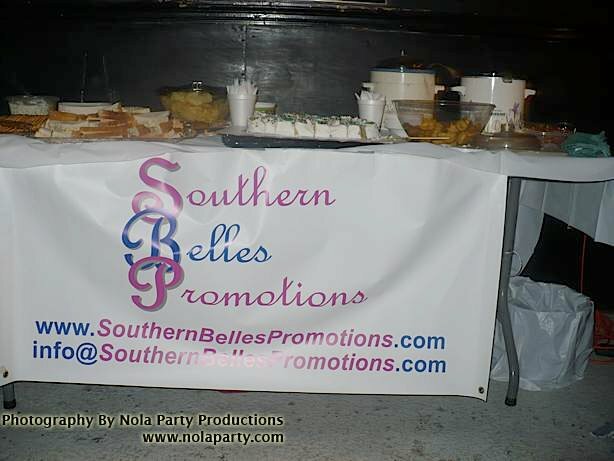 SouthernBellesPromotions 1. Services for targeted direct Marketing Campaigns – Live Event or PromotionExperiential Event Marketing (interacting face to face with and engaging consumers in a targeted direct marketing campaign), to create, design, production, mananagment, and staffing of event or promotion, includes Management and Staffing of preplanned events or promotions. Examples of live events or promotions at trade shows, corporate meetings, concerts, fairs, festivals, in store, on site, sports arenas, etc... We send you recaps which include reports and photos. 2. Services for Event ManagementHandles the Research, Design, Planning/Marketing, Coordination/Execution, and Evalutions for events. We will take on one or all of these areas. SouthernBellesPromotions Goals are Focused – 1. To represent client to consumers in initiatives designed by clients then executing successful marketing campaigns for those clients. 2. Bringing everyone together to create a more vibrant entertaining event. SouthernBellesPromotions'SBP's success lines in the flawless execution of our client's program goals.Achieving those goals vary from one client's program to another and takes commitment,. organization and planning. Creativity, patience, and communication from beginning to end, to researching event sites and venues, to negotiating contracts, buy-ins and sponsorships, to providing tour and in-market staff to execute these programs.Each program is created and executed according to our client’s goals and objectives.As a marketing and events company we pride ourselves in the following:– Accountability– Competitive– Field Staff– Past Success– Customer / Client relationshipsClient Relationships – SouthernBellesPromotions works closely with our clients to ensure thateach program achieves maximum consumer awareness and exposure through attention to detailand planning. Each program is individually customized to meet our client’s needs. SouthernBellesPromotions Philosophy is simple – "Our Southern Hospitality and Warm Smiles are a Friendly Way of Greeting Everyone" SouthernBellesPromotions Motto – "It's We @ SBP!" ______________________________________________________________________________Southern Belles Promotions Background• SBP an event marketing business•Releases news and information to a targeted market •SBP is an independently owned and operated business • In business for (6 years)• Headquarter in Lucedale MS•SBP Owns and operates a valuable portfolio of contacts that network together to produce the outcome of client’s goals •Proven analytical and project management skills•Experience in the event/promotion/music industry•Excellent interpersonal and communication skills both verbal and written. • Approximately 100% travel • Uses Highly Trained Professional Independent Contractors, each with years experience,U dergo hours of additional training EVERY year.• Offering clients services with : Event Marketing Management and Staffing Event or Promotion Creativity• 20+ Clients• Has helped obtain over ($10 million in sales)• SBP Operates through the use of guerilla marketing techniques, creative event production and consultation, sponsorship acquisition, publicity, artist relations and activation ______________________________________________________________________________AWARDS/RECOGNITIONS/PARTICIPATION Dec 4th, 2010Southern Belles Promotions placed 3rd place for the SBP Parade Float in the Annual Christmas Parade in Lucedale, MSParade Theme: Centennial Christmas (100 yrs for George County and Jesus' Birthdays)Float Name: CelebrateFloat Theme: Birthday Party (Cake as party theme)#: 52 Colors: Blue/SilverSong: Celebration by Kool & the gangDescription: Skirting(Blue Metallic), garland(blue/silver), 300 white lights, Runners on 2 sides(blue), gifts(blue foil, silver foil, topped with silver stars), 4 5" blue/silver ball ornaments, 4 big silver stars outlined with blue/silver garland hanging in corners, cake in middle of trailer on 3 pallets wrapped in blue, cake white, 14 candles(battery orperated), blue and silver decor. Sound system playing theme song every other time with mixed music. 70+ floats, 12 staff. Dec 5th, 2009Southern Belles Promotions placed 1st place for the float in the Christmas Parade in Lucedale, MS on Saturday, Dec 5th, 2009. Parade theme: Peace on Earth Float theme: Harmony-The Lion and the Lamb. 78 + floats entered parade this year. Used an inflatable 72" screen for relating the creative ideas. With a big stuffed Lion and Lamb in front. We had 13" Bears, caps, tsirts, candy/novelities, beads, and a few selected big boy throws to throw out to the public. The crowd roared as we passed them, what a feeling. Our marketing strategy goal was to see how many impressions we could make during the parade. While leaving them something to remember us by. #59We received $100 as 1st place winners for small business category. "Thank You!" goes out to all our supporters during the parade. Dec 2007Anuual Christmas Parade and Party ---------------------------------------------------------------------------------------------------------------------------------------Dec 22, 2010Nola Party's 5th annual Children's Hospital Benefit Toy Drive Concert! HIP HOP 4 TOTS - A TOY DRIVE BENEFIT CONCERT FOR CHILDREN'S HOSPITAL NEW ORLEANS, LA.Date: December 22nd 2010Location: The Frat House 8200 Willow St. New Orleans, La. 70118Time: Doors 9pm Show 10pm Cost: $5 or bring a NEW toy and get in FREE http://www.nolaparty.com/Dec 2009Nola Party's4th annual Children's Hospital Benefit Toy Drive Concert! Dec., 2008Nola Party's 3rd annual Children's Hospital Benefit Toy Drive Concert! Keystones. ++++++++++++++++++++++++++++++++++++++++++++++++++++++++++++++++++++++++++++++2008Travel South Showcase on the gulf coast. Mississippi Coast Conventions & Visitors Bureau. "Our Southern Hospitality and Warm Smiles are a Friendly Way of Greeting Everyone." We love to have fun doing what we love. Interacting with others while passing out freebies or giving product information. Experiential Event Marketing (interacting face to face with and engaging consumers in a targeted direct marketing campaign), to create, design, production, mananagment, and staffing of event or promotion, includes Management and Staffing of preplanned events or promotions. Examples of live events or promotions at trade shows, corporate meetings, concerts, fairs, festivals, in store, on site, sports arenas, etc... We send you recaps which include reports and photos. Handles the Research, Design, Planning/Marketing, Coordination/Execution, and Evalutions for events. We will take on one or all of these areas. 1. To represent client to consumers in initiatives designed by clients then executing successful marketing campaigns for those clients. 2. Bringing everyone together to create a more vibrant entertaining event. SBP's success lines in the flawless execution of our client's program goals. Achieving those goals vary from one client's program to another and takes commitment,. organization and planning. Creativity, patience, and communication from beginning to end, to researching event sites and venues, to negotiating contracts, buy-ins and sponsorships, to providing tour and in-market staff to execute these programs. Each program is created and executed according to our client’s goals and objectives. and planning. Each program is individually customized to meet our client’s needs. Philosophy is simple – "Our Southern Hospitality and Warm Smiles are a Friendly Way of Greeting Everyone"
Motto – "It's We @ SBP!" •Excellent interpersonal and communication skills both verbal and written. • Uses Highly Trained Professional Independent Contractors, each with years experience,U dergo hours of additional training EVERY year. 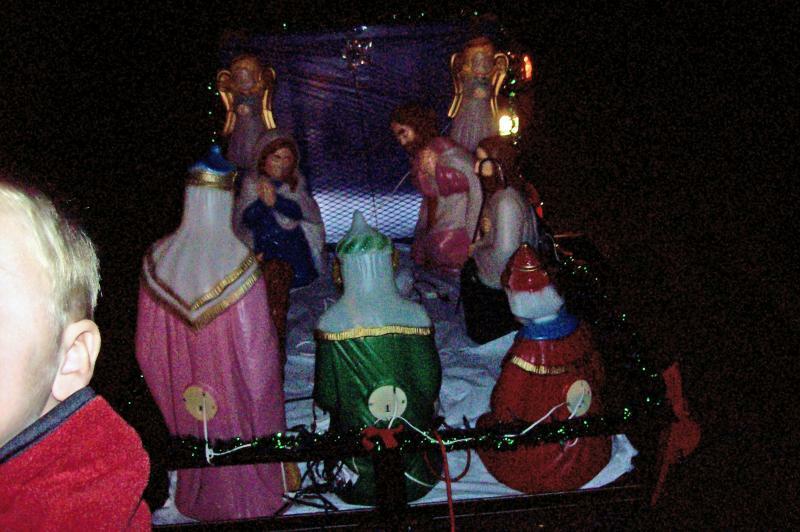 Description: Skirting(Blue Metallic), garland(blue/silver), 300 white lights, Runners on 2 sides(blue), gifts(blue foil, silver foil, topped with silver stars), 4 5" blue/silver ball ornaments, 4 big silver stars outlined with blue/silver garland hanging in corners, cake in middle of trailer on 3 pallets wrapped in blue, cake white, 14 candles(battery orperated), blue and silver decor. Sound system playing theme song every other time with mixed music. 70+ floats, 12 staff. 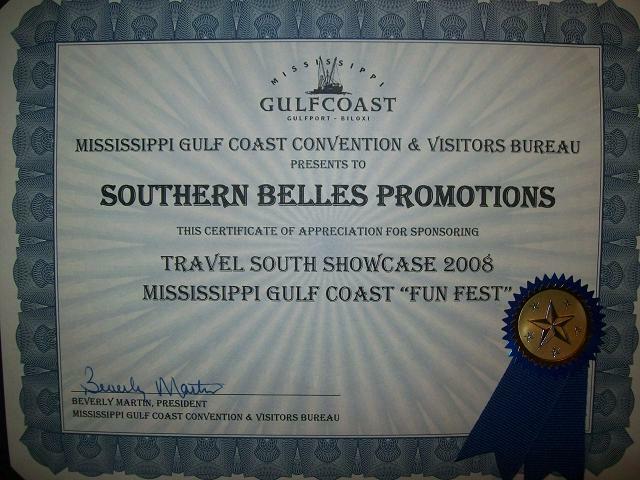 Southern Belles Promotions placed 1st place for the float in the Christmas Parade in Lucedale, MS on Saturday, Dec 5th, 2009. Float theme: Harmony-The Lion and the Lamb. 78 + floats entered parade this year. We received $100 as 1st place winners for small business category. "Thank You!" goes out to all our supporters during the parade. Nola Party's 5th annual Children's Hospital Benefit Toy Drive Concert! 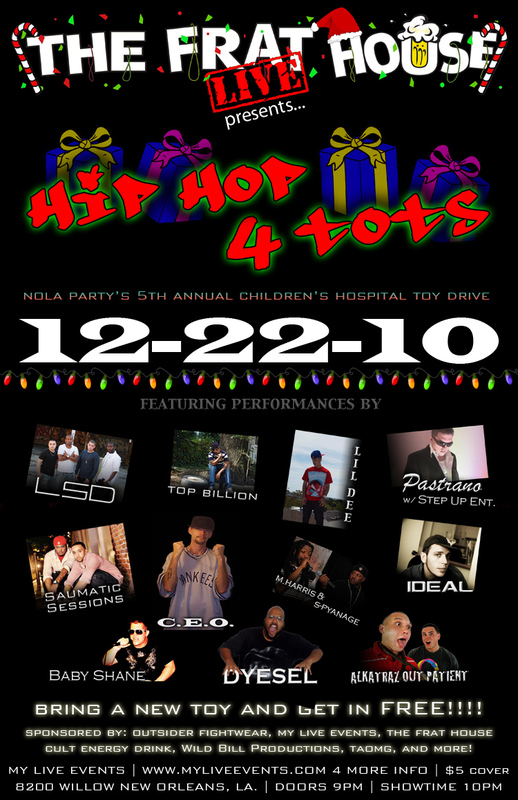 HIP HOP 4 TOTS - A TOY DRIVE BENEFIT CONCERT FOR CHILDREN'S HOSPITAL NEW ORLEANS, LA. 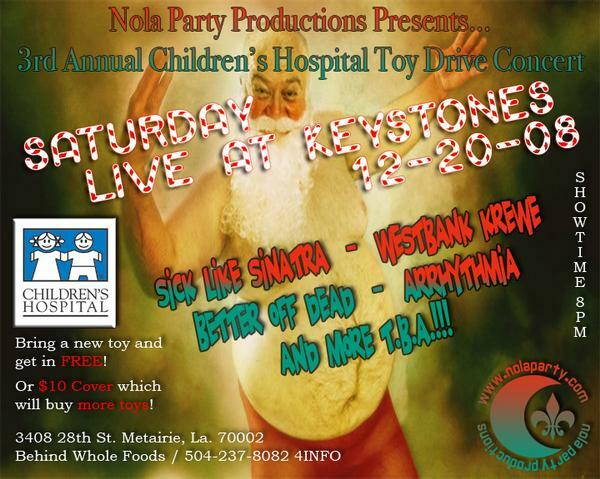 Nola Party's4th annual Children's Hospital Benefit Toy Drive Concert! 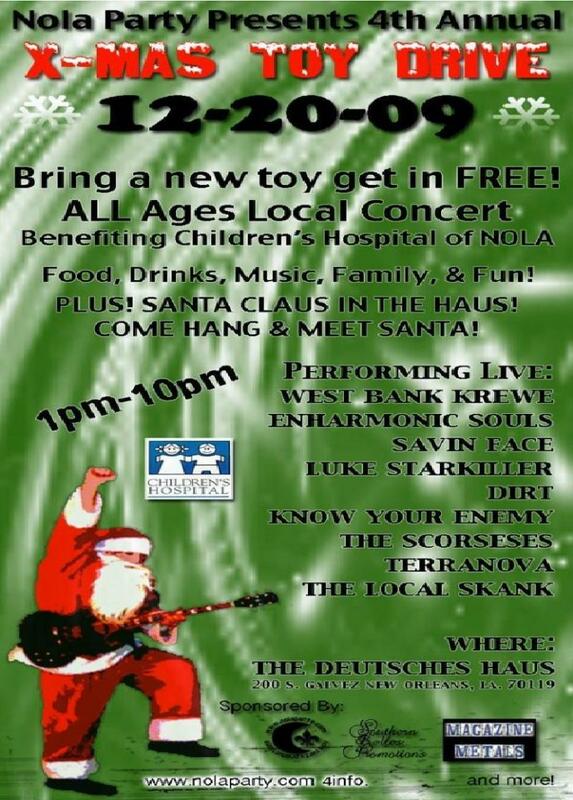 Nola Party's 3rd annual Children's Hospital Benefit Toy Drive Concert! Travel South Showcase on the gulf coast. Mississippi Coast Conventions & Visitors Bureau. We are Food Management Certificed with the National & MS Restaurant Association (ServSafe). We are members of the American Red Cross, where we were trained for Diaster Response and Shelter and we volunteer and travel locally/nationally. You can find our ads on retail service industry, elle conultants, and we are featured on Nascar Day 2008 & 2009 Page of Participants. *All photograph rights belong to SBP. 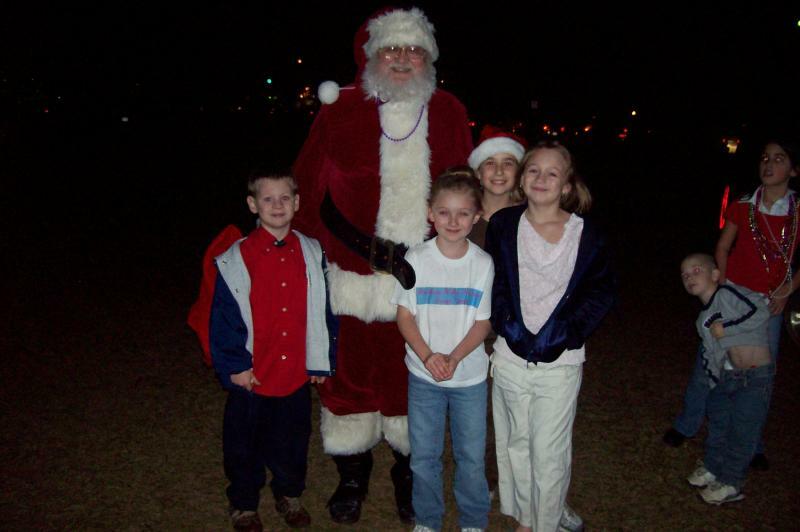 *Copyright © 2006-2014 All rights reserved by Southern Belles Promotions.